Home»Archive by Category "Do It Yourself Divorce"
Even with a “low-stress” do-it-yourself divorce, you’ll probably find that there is a lot more pressure than you initially think. Divorce upsets the ecosystem of our lives. Sometimes the fallout is better; sometimes it can be worse. The problem is, when you’re just getting used to being on your own again, you don’t know which it will be. That uncertainty brings with it a lot of negative feelings and stress with which it can be hard to deal. 1. Engage in deep relaxation methods. If you can’t afford professional hypnosis or a yoga class, there are plenty of resources for putting these methods to work in other more affordable ways. It may not produce the same effect, but it’ll certainly help if you’re committed. Check the apps on your smartphone, read, or just set aside time each day to lay down, clear your thoughts, and use deep breathing techniques. Isolate yourself from sounds and other distractions and just meditate. You’d be surprised at the difference one hour or even 30 minutes a day can make. It’s common knowledge that we feel more composed and healthier when exercise is a daily part of our lives. So why do we fight it so much? It all boils down to habit. If you can force routine exercise into your daily routine, then the positive effects will take over before you know it. The important thing is to start and not stop. And if you have stopped, then it’s time to lace up the shoes and head to the track or weight room. Comfort foods may lift your spirits when you’re feeling down, but they do very little to improve your long-term attitude and health. Like liquor, they can also become habit forming. While no one will fault you for having the occasional cheat-night, make it the exception to the rule. 4. Keep contacts with your ex professional. Remember you’re no longer in a relationship once you file for divorce, so stop acting like you are. It may seem cold and impersonal at first, but in the end, you and your ex will be the better for shifting gears from husband and wife to partners in an amicable divorce. These four steps will help you through the awkwardness and uncertainty of separating and transitioning to single life after being married. Stick to them, and a new and happier you will emerge. Best of luck! It’s a bit surprising that so many couples enter into marriage without ever facing the possibilities that it could one day end in divorce. On the one hand, you don’t want to think about a marriage ending when you’re going in to it, but at the same time, this mindset can lead to taking each other for granted. Before long, you grow apart because you haven’t taken the time to work on the relationship. Stagnating like this happens to be a big driver of do-it-yourself divorce, where couples grow apart before ever realizing that anything is wrong with the relationship. If this isn’t the fate that you want for your marriage (or future relationships), here are some suggestions to prevent it from happening. While this may seem counterproductive to working on your relationship, it really isn’t. Most couples, who end up deciding to file for divorce, do so because they never have a chance to miss each other. Losing sight of what makes you unique as a person can devalue the time you spend together. When you have nothing to share with each other, communication becomes more difficult because you feel like you’ve already heard the other’s stories. When communication breaks down, so does the marriage or relationship. Secondly, Always Have Something To Look Forward To. Nobody can fault you for falling into the routines of life and work. These routines are necessary for personal growth and fulfillment. However, if all you ever do is the same thing over and over again, boredom can take hold of the relationship and drive you both toward a divorce. To combat this danger, always have a trip or event that you can look forward to — something you both enjoy that allows you to take a break from your busy life and experience new adventures together. It could be a cruise or a wine festival. Just have something always on the radar, and you’ll always have each other in your lives. 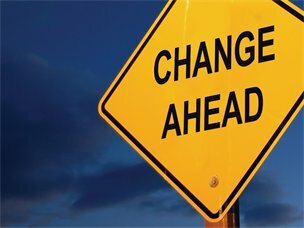 Finally, Address Problems As They Arise. Fighting may sound like a bad thing, but it’s really the only way that you can learn conflict resolution as a couple. Don’t avoid arguments when they arise. Be heard, but also, be respectful. It may make for an unpleasant evening, but it will keep you away from divorce. If your relationship is past the point of help and you’re ready to undertake a DIY divorce, let us help you get started today. Our court-approved forms and easy compiling/filing process will take the work out of your hands and help you hold on to more of your money. As a do-it-yourself divorce service, we see a lot of parties who are interested in filing on their own, but many end up having to go to court even though it isn’t their first preference. That’s because they don’t have an agreeable spouse and there is too much conflict to move forward. We’ve always said that DIY divorce is only for a certain type of couple: the kind who can treat the procedure as a business transaction rather than an emotional war. Today we thought we’d share a glimpse of what some of the disagreements are that so often derail this type of divorce. According to our research, children are usually factors in around 52 percent of divorce cases. Most of the time, one parent is awarded primary custody while the other must pay child support as the non-custodial parent. In many cases, this doesn’t set well with the non-custodial party because they love their child and would rather be in a custodial role. The disagreement can lead to bitterness and courtroom drama, and it can place the child at the center of it all in a tug-of-war they’re not emotionally prepared for. Unfortunately, one or both parties are too blinded by revenge to consider what they’re doing to the child. Other than simply wanting custody or wanting more visitation time, the non-custodial parent will often find themselves in the position of having to pay child support. This can create a two-sided conflict. For the non-custodial parent, it’s about paying more for less time spent with their child. For the custodial parent, it’s the perception of not receiving enough support to adequately cover childcare costs. Seeing eye-to-eye on these issues isn’t easy, and if the parents can’t agree, then lawyers will most likely be necessary. In many cases of divorce, one partner fights for alimony, or continued financial support from the second partner, even when children are not involved in the breakup. The construct is built on the idea that both partners sacrifice in a marriage. If one partner did not work outside the home, but instead gave up opportunities to stay at home and raise the children, this can win the sympathy of judges upon reaching a final decision. The payor, however, may see things differently, and may not be fond of the idea that they have to continue to support someone with whom they may no longer be able to stay in the same room as. The decision to file for divorce is often plagued by conflict — the kind that can cost you time in a lawyer’s office and run up a hefty bill. DIY divorce is a better alternative, but make sure issues like those listed above can be resolved amicably before proceeding. 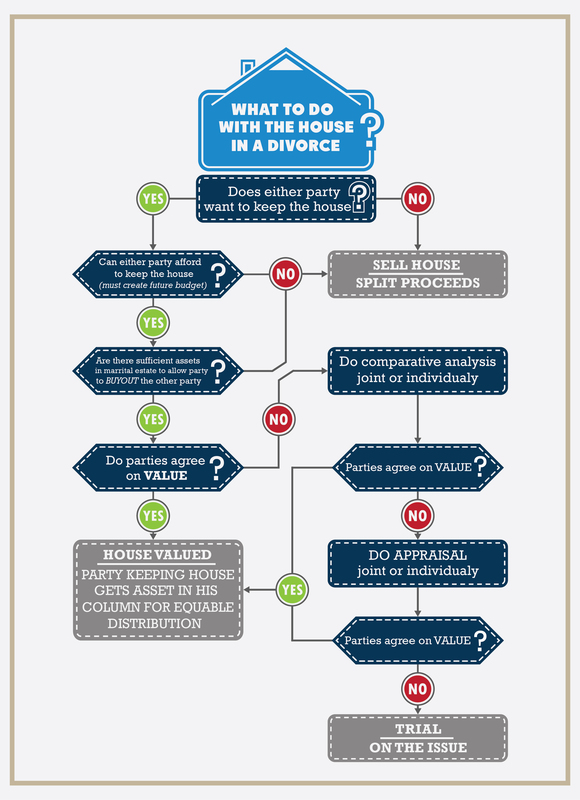 A new infographic on Huffington Post illustrating what happens to your house in a divorce highlights the opportunities that one can utilize for keeping out of court and bettering the odds of a conflict-free do-it-yourself divorce. What To Do With The House In A Divorce? From there a series of questions are presented with appropriate pathways drawn to the next step in the process should you answer Yes or No. Does either party want to keep the house? Are there sufficient assets for one party to be able to buy out the other? Can either party afford to keep the house? Do parties agree on value of the house? Each of these questions have a different step in the process depending on the Y or N. For instance, if neither party wants to keep the house when they decide to file for divorce, they can simply sell it and divide the proceeds. Easy enough, right? But if one does want to keep it, what happens then? Well, a value for the home must be agreed upon by both parties in order to maintain equitable distribution of assets. If that value cannot be agreed upon after a third party appraisal, then the case will likely head to trial. However, being able to use outside help such as appraisers and mediators for any type of conflict that arises will improve chances of a successful DIY divorce. It’s About Keeping An Open Mind. By simply asking yourself what you’re willing to negotiate on, you can keep your mind open throughout the entire process. This could lead to being able to divorce without the added financial burden of attorney’s fees and continued fighting as conflict surrounding the end of a marriage tends to perpetually create. As you consider the alternative of a trial divorce, many of these negotiation points will fall in to place because, otherwise, divorce can cost thousands upon thousands of dollars and be stress-inducing and time-consuming — never good combinations! If we can help you and your partner walk through a painless divorce process, let us know. Our DIY divorce forms are court-approved and the process is nearly automatic. Regardless of what you decide, best of luck to you!